Lana’i is a bit of a strange place because despite being so small there seems to be a dispropriately large number of places to eat. But like Maui it has its own farming issues so food can be expensive and it means you need to be careful what you choose but here is what we liked. Definitely a diner-type place in Central Lana’i but this food is really good – well at least the fish is. We split a salad that was nothing special with a fish sandwich so fresh I’m sure it was caught that morning. The best part is unlike other places that dare to charge you $8 for splitting a dish, the staff here don’t even blink when you ask for another plate so you can split a meal. Another little diner type place. 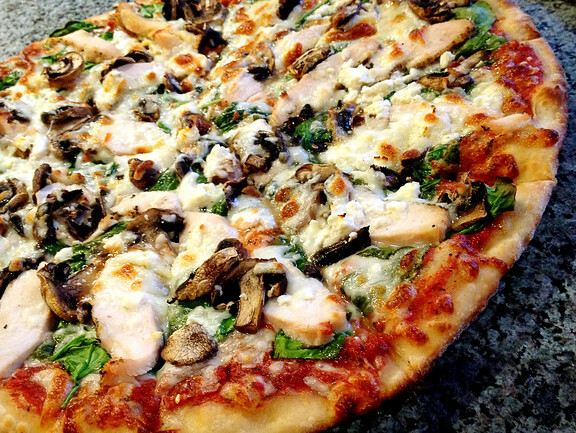 We weren’t looking for a big, formal meat so when we saw the spinach mushroom pizza we jumped on it. The staff here is SO friendly, and the woman making the pizza came out to talk to us. I think most locals come here for the plate lunches but the pizza was fantastic and there is wifi. If I lived in Lana’i I’d eat here often. So I have been eating at a lot of nice restaurants in Maui but here in Lana’i it’s nice because Fresco is outside overlooking the water but the food is also fantastic. I was only able to take a photo of the bread basket before dusk fell but we had fantastic scallops. It’s more expensive than the other places but a great place for a couple although my mother and I still had a lot of fun on our own. That food looks fifty times better than the food I have been introduced to over here in Europe. I must say as an American I am very spoiled with the food quality and choices available to me. I will never complain again. Looks like you have had some delicious bites! You haven’t had any good food in Europe yet? Where are you eating? That pizza looks ridiculously delicious! It was as good as it looks! The fish burger looks good, but that pizza looks incredible – I think perfect! Perhaps because you get to eat so much fish but pizza, at least good pizza is rare for you? I’m with Andi — That pizza looks delicious! I’d definitely recommend it on Lana’i. If I ever make it back to Hawaii one day, I’ll know where to click for good eats! Your blog makes me hungry! Ha, you need to write more about food in Spain where it’s always delicious! Its a great help to Lanai visitors. Yes, while traveling then we need nice restaurants to have our meal. So, your post is really very important. 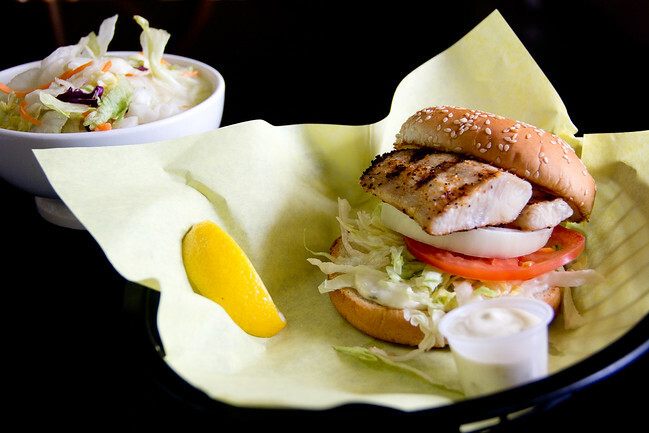 That fish sandwich looks amazing and yummy! I can’t decide which I want more the pizza or the fish. You’ve had outstanding dining experiences on the islands. Delicious! I may have to rethink Hawaii as being all about poi. SO much more than poi, which is really good to discover as I’m not a fan. Food was one of my favourite parts of Hawaii – I’m obsessed with Polynesian cooking and I also had some of the best sushi I’ve ever had in my life in Maui…mmmm…that fish burger is making my mouth water!